Radhika is an ex-art director from the world of advertising who decided to put her interest and passion for emerging fashion across asia into a blog. A SAFETY PIN: This blog serves as a platform for the emerging fashion talent in Asia. It simultaneously serves as an online space for discovery, perspectives, exchanges and conversations on the rise of fashion talent across the world. 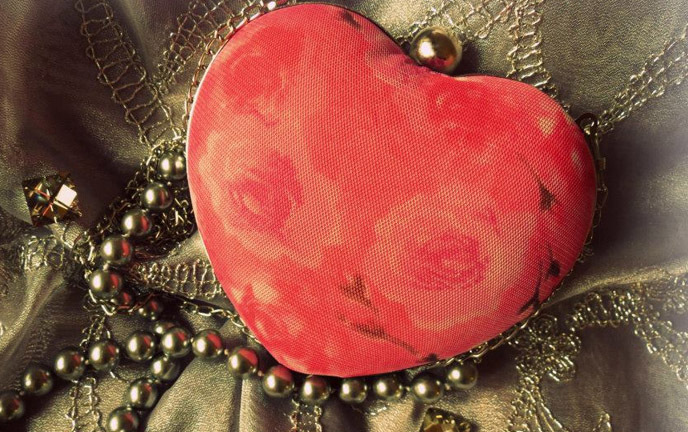 The young entrepreneur and accessory designer Tarini Nirula's clutches are a rage in the fashion world. Renowned for her fun-themed, hand-crafted minaudieres, her passion for fashion started at a very young age and manifested into her profession. An interesting play of colors, textures, prints and embellishments sets the tone for each piece. Tuned to doing things with a fresh mind and thought Tarini cleared up her schedule to make sure she would do this interview full justice. Her sincerity, passion and commitment is reflected in her work. Radhika: What did you want to be as a child? Tarini: I have been passionate about designing ever since I can remember. As a little girl, I loved fashion, dressing up and accessorizing. I would ask my mother to draw fashion figures for me, which I would then color in and accessorize. I think it’s safe to say that the inclination towards fashion and the creative arts started from a very young age. Radhika: Do you have a fashion background? Tarini: Topping in the subject of Art in my school (The Shri Ram School), I went on to apply to NIFT, which is the best fashion institute in India. After completing a four year intensive program and armed with a degree in fashion and lifestyle accessories, I started working on projects with design studios through which I gained experience in the industry and also experimented with various styles of design. After a year, I launched my own label of luxury fashion accessories and graphics. Radhika: What inspired you to create your own label? Tarini: To put it simply, designing accessories is what comes naturally to me, and I love every bit of it. Though it was not an overnight decision. I experimented a lot with various styles of design, before finally realizing that this is my true calling. I did a bit of styling, designed clothes, worked on a lot of graphics-digital and by hand, and of course, designed accessories throughout. I think the time that it really struck me was when I noticed that I had been in a fabric shop for 4 hours, but it felt like hardly any time had gone by! Looking at all those colors, patterns and textures always leaves me with a tingly feeling of excitement, of creating something completely fresh out of an idea. Shortly after, when I designed my first collection of bags in 2011, all the pieces sold out within a week, and that’s when I decided that I was going to take my passion and make it my profession. Radhika: Tell us how your label came into being and how did it evolve? Tarini: I launched my design label in 2011 and there has been no looking back ever since. After the sell out of my debut collection, I collaborated with renowned fashion designer Jenjum Gadi for the Wills India Fashion Week, where in I designed coordinated accessories to match the outfits on the ramp. I have also been designing a range of accessories for textile designer Bina Rao for her label Creative Bee, using fabrics that are all natural hand loom pieces. Apart from the various features in leading fashion magazines that include Vogue and Marie Claire, my designs are now available on Pernia’s Pop up Shop, one of India’s leading fashion retail websites. I receive inquires from all over the world, and have supplied to buyers in Paris, Milan, Germany, Australia and the Middle East to name a few. I feel blessed to have people from different parts of the world appreciate the designs I create, and hope to spread all the joy I can through these pieces of art. Radhika: What's the best part about your work? Tarini: All my collections are born with things that inspire me – vibrant colors, art movements, shapes, moods, architecture, culture, people, fashion trends, music and so on. Travelling and sourcing for different fabrics and materials, and finally holding a piece that was once just a vision in my head, is one of my favorite feelings. And when a buyer tells me how wonderful their experience of carrying that piece was - that is an indescribable feeling! Radhika: What's your personal favorite bag from your recent collection? Tarini: One of my personal favorite bags from my recent collection is the digital printed Minaudière with beadwork on it, called ‘Fierce’. It’s inspired by the strong, confident and stylish woman of today. Radhika: Do you have any other passions besides designing accessories? Tarini: Besides designing, I also love travelling. I like to visit places I haven’t seen before, and meet new people. I also enjoy yoga, it’s therapeutic for me, and makes me feel fit enough to work long hours and stay agile. I love spending time with my family, which includes my pet dog Leo, who has even served as an inspiration for a few designs! I enjoy sports and being outdoors and I am an avid tennis follower. I also love seeing various styles of performing arts especially live performances by musicians. Radhika: What are your aspirations as a designer? Tarini: I have a strong vision for my design label. Being an entrepreneur is essentially all about planning right and taking calculated risks. I am always aspiring to create more unique designs, continue expanding my operations and reach out to every part of the world. Radhika: Who is the woman you design for? Tarini: My label is targeted towards women who are fashion conscious, have a keen eye for chic and classy designs, and at the same time have the desire to experiment and carry off their accessories with confidence and panache. Radhika: What makes your design distinctive from other designers? 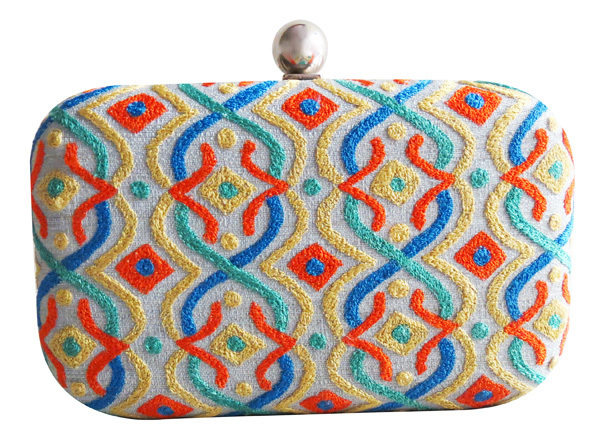 Tarini: Each piece of my collection of handcrafted Minaudière Clutches reflects my inspirations as well as my design philosophy. The art movements, the beauty of nature, optical illusion patterns, Mughal Architecture – Each collection has a story, an inspiration behind it, which may be directly or indirectly represented. Various techniques like applique work, artisans who create each piece by hand have explored embroidery and use of embellishments. Each Minaudière is like a piece of art, which is why all the ranges have a limited number of pieces, to add a touch of exclusivity along with an aesthetically strong design and functionality. Radhika: How would you define your design aesthetic? What excites you about accessories right now? 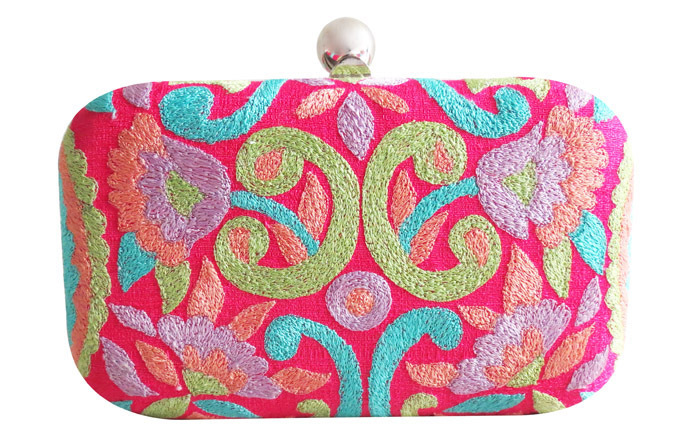 Tarini: Tarini Nirula- my design label, is synonymous with exclusivity, style, and a passion for the creative arts. My love for a high contrast color palette highlights the various hand made embroideries and surface ornamentation, making each piece a work of art. What excites me about accessories is the continuing evolution in their forms and their ability to completely transform an outfit. Radhika: If you had to design one thing which you haven't tried to, what would it be? Tarini: An exclusive range of bags for men. BEHIND THE SCENES AT TN ACCESSORIES! Let others know what you are reading..
"Hi Tarini, Thank you! The Minaudière’s are beautiful. The ‘Phoenix’ design in fact looks even better in real and I’m so glad I ordered it. This is the second time I have also ordered the ‘Sunburst’ and it’s as pretty as ever! " 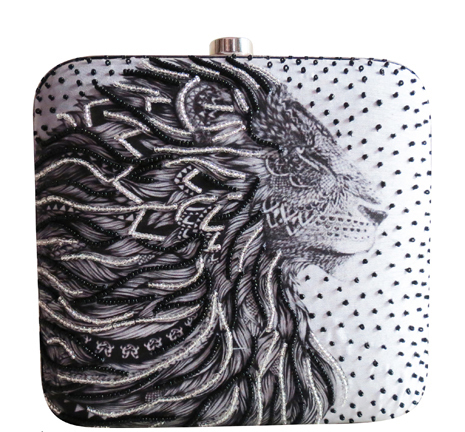 " Thank you very much for sending the ‘Phoenix’ Minaudière all the way to London. I love it even more now after seeing it for real. Also appreciate the handwritten message. The packaging is very neatly done. Thank you for the special pouch to store the clutch, very thoughtful of you. " " Loved shopping at your online boutique! It was a brilliant shopping experience. Very meticulous with the delivery and ensured a good customer experience. Loved all the designs for my trosseau and choosing one design was the only difficulty I faced! 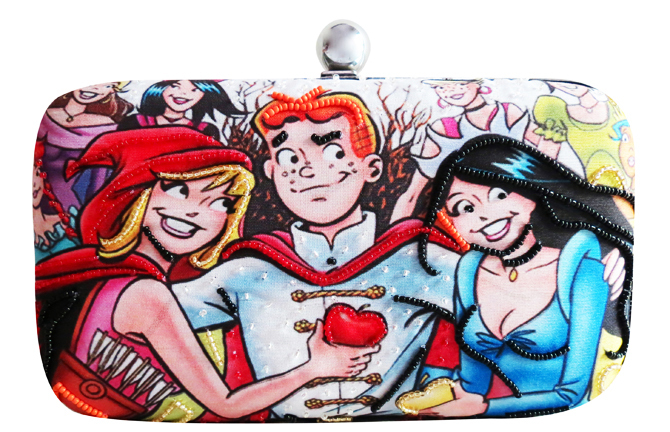 Loved my clutches and can’t wait to flaunt it "
" Received the beautiful ‘Enchanted’ Minaudière, loved it! Especially the way it’s designed with minute details and excellent finishing. Really gorgeous colour combination too! " 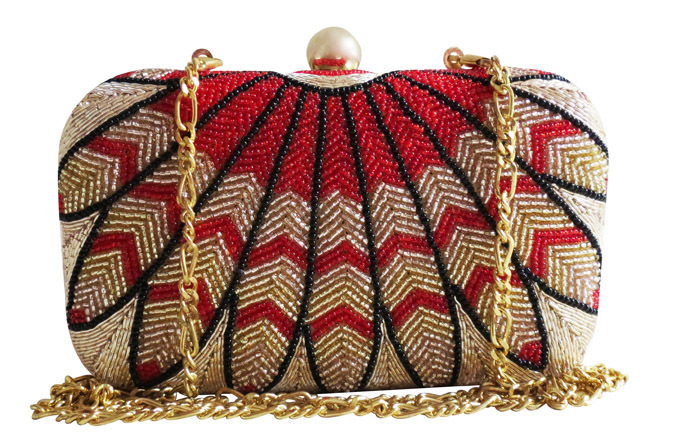 "I carried the ‘Weave’ Minaudière last night and got so many compliments, thank you! " 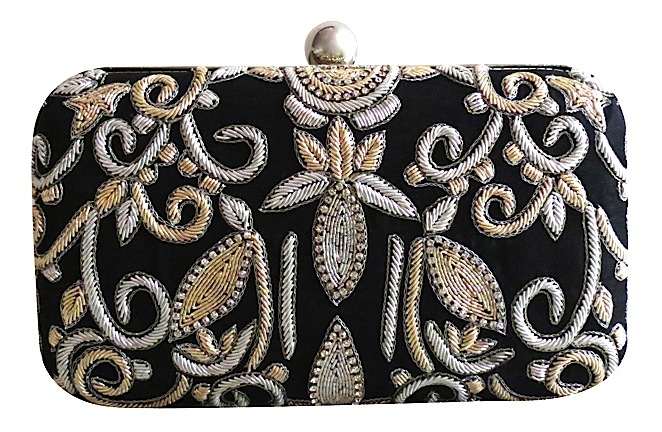 "I just wanted to let you know that I received the Ivory Zari clutch this morning. It's absolutely gorgeous, and I'm so impressed by the quality, detailing and finish. Love it, thank you!" "I have received the Tropical Bliss Minaudière, and I must say that it is beautiful, just as it looks like in the picture! Thank you"
2019 © Tarini Nirula's Online Boutique. All rights reserved. Sign Up here & enjoy 10% off on your first purchase!